Ladakh is a trans-Himalayan mountain desert in the extreme north of India with villages located at 2,700m to 4,000m altitudes. It is a cold desert with winter temperatures touching -30° C, and an average annual rain/snow fall of only 100 mm. Human settlements are almost always located around glacial streams which feed into the Indus and other rivers as tributaries. The key to human settlement in this cold desert is the art of diverting water from the streams through meticulously built canals toward deserts to grow crops like barley, wheat, vegetables and trees like apricots, apples, willow and popular. The man, the real hero, was born in 1966 in Uleytokpo, near Alchi in the Leh district of Jammu and Kashmir. He was not enrolled in a school until the age of 9 year as there weren’t any schools in his village. His mother taught him all the basics in his own mother tongue till that age, contrary to what others would say, he considers himself lucky to have been spared the pains of schooling in alien languages which other children are forced to !!! it is stated that he looked different compared to the other students, would get addressed in a language that he did not understand; his lack of responsiveness was mistaken for being stupid. Years later, he was to complete his B.Tech in Mechanical Engineering from National Institute of Technology (then REC), Srinagar in 1987. He went on to win a Rolex Award for Enterprise on November 15, 2016. He received 100,000 Swiss francs (Rs 67 lakh) and one of the world’s most expensive watches engraved with his name from actress Michelle Monaghan. The gala event at the Dolby Theatre in Los Angeles had Hollywood celebrities like James Cameron and Don Cheadle and conservation star Sylvia Earle in attendance. Every other year, Rolex supports individuals with innovative ideas that make the world a better place. 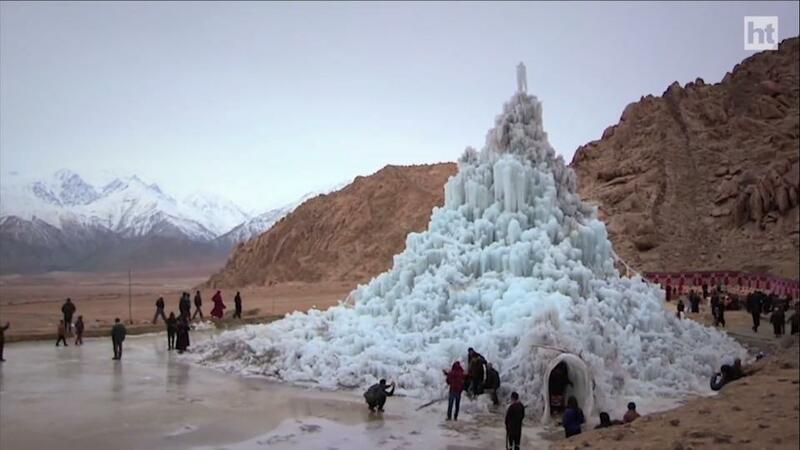 To solve water problems in a cold desert, this man had come up with a path-breaking idea: freeze millions of litres of water in the form of ‘ice stupas’. Can you make out who he is ? ~ sad in a Nation lost in cinemas, we fail to recognize reallife heroes !!! Nanban directed by Shankar, starring Vijay, Jiva, Srikanth, Sathyan and Sathyaraj was a good entertainer; it was a remake of ‘3 idiots’. The knot of the movie was all about education – how the most studious behave and how not so good in class are ill-treated. Years later after college days, Of the trio, Venkat becomes a successful wildlife photographer, Senthil, gets married and settles happily in a middle class life; they set out to find their classmate Panchavan Pari around whom there is lot of mystery. Sathyan that first bench boy turns wealthy and successful pro owning a company – comes down looking to seal a deal with Kosaksi Pasapugazh, a famous scientist and prospective business associate. They find out that Panchavan Parivendan is altogether different - at Dhanushkodi, they end up meeting Kosaksi Pasapugazh, who of course is none other than Pari ! In the original version in ‘3 idiots’ the trio alongwith good student upon arrival in Ladakh, find the village school, witnessing young students' inventions that resemble Rancho's own college projects. Assuming Rancho to be a mere school teacher, Chatur insults Rancho, and asks him to sign a statement that he is the less successful one. Seconds later it is revealed that "Rancho" is Phunsukh Wangdu, an inventor with over 400 patents, with whom Chatur seeks a contract. Let us stop the movie here ! ~ for our hero is much much greater …. 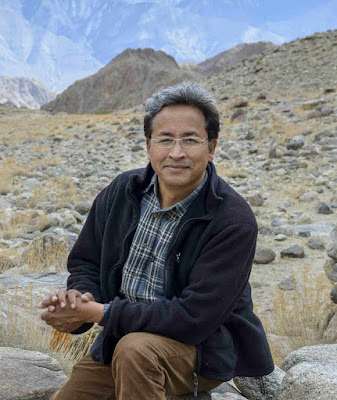 The man we should be talking about, photographed at the start and about whom the 2nd and 3rd para of this post is all about - Sonam Wangchuk is an engineer, innovator and education reformist. He is the founding-director of the Students' Educational and Cultural Movement of Ladakh (SECMOL) which was founded in 1988 by a group of students who had been in his own words, the ‘victims’ of an alien education system foisted on Ladakh. SECMOL campus runs on solar energy and uses no fossil fuels for cooking, lighting or heating. Of his many inventions, the Ice Stupa technique that creates artificial glaciers, used for storing winter water in form of conical shaped ice heap, got him the precious Rolex award. HT had an article that wrote – for a man who’s just won the prestigious Rolex Award for Enterprise, Sonam Wangchuk comes across as very affable, humble even. His lithe frame betrays the years that he has put in engineering an educational and cultural movement in the remote ‘Land of high passes’ that is Ladakh. This movement has instigated an alternate, pragmatic approach towards education, leading to a massive drop in failure rates of school students. Concurrently, it has also led to the invention of Ice Stupas – “tall towers or little mountains” of ice, which can potentially help resolve the water scarcity problem in the cold desert region. Afterwards, while pursuing his mechanical engineering, he began teaching children to earn an income. “That is when I realized how deplorable the state of education was in the region,” the 50-year-old says. According to statistics from the Himalayan Institute of Alternatives (HIAL), an alternative university for mountain development that Wangchuk is setting up, 95 per cent students failed their board exams in 1996. Over the next two decades, this number has steadily decreased to 25 per cent this year – courtesy the alternative learning practices and other innovative measures that Wangchuk helped develop. It is for this simple yet genius invention that Wangchuk was bestowed with the Rolex Award for Enterprise last month. He now plans to use the prize money as seed fund for his dream project – the Himalayan Institute of Alternatives. The institute aims to “create a sustainable ecosystem of constant innovation”, wherein youth from different Himalayan countries will come together to research the issues faced by mountain people – in education, culture and environment. “The world needs real-world universities, ‘doer’ universities. We’re going to set up one model of it in Ladakh. And if it is successful, we hope it’ll have a ripple effect from New Delhi to New York,” Wangchuk enthusiastically signs off.